On the campaign trail, Donald Trump vowed to fix trade with Mexico and Canada. Now details are emerging about how he may approach doing it. The White House has given Congress a head's up that it intends to begin renegotiating the North American Free Trade Agreement, and has signaled it will push hard to bring back tariffs. The move was widely expected since Trump once called NAFTA the "worst trade deal in history." In an eight-page draft memo to Congress obtained by CNNMoney, Stephen Vaughn, the acting U.S. Trade Representative, gives the most detailed look so far at White House plans to redo NAFTA. According to the document, a top goal of the White House is to be able to put tariffs (a code word for taxes) on Mexican and Canadian goods if the Trump administration believes there is "serious injury or threat of serious injury" to U.S. companies. White House spokesman Sean Spicer downplayed the significance of the memo Thursday, saying at his daily press briefing that it's "not a statement of administration policy." In the memo, which was first reported by the Wall Street Journal, Vaughn says the tariffs would only be "temporary," but the Trump administration wants the ability to use them to "vigorously enforce" bad trade by America's neighbors. Vaughn's office refused to comment on the document. Robert Lighthizer, who Trump has tapped as top Trade Representative, is awaiting Senate confirmation. Mexico's economic minister Ildefonso Guajardo reiterated Friday that Mexico would fight tariffs in any NAFTA renegotiation. "We must deliver results and guarantee the win-win-win equation for the three countries," he said. Trump has repeatedly said his economic plan is "Buy America, Hire American." He's blamed Mexico and China for stealing U.S. jobs. 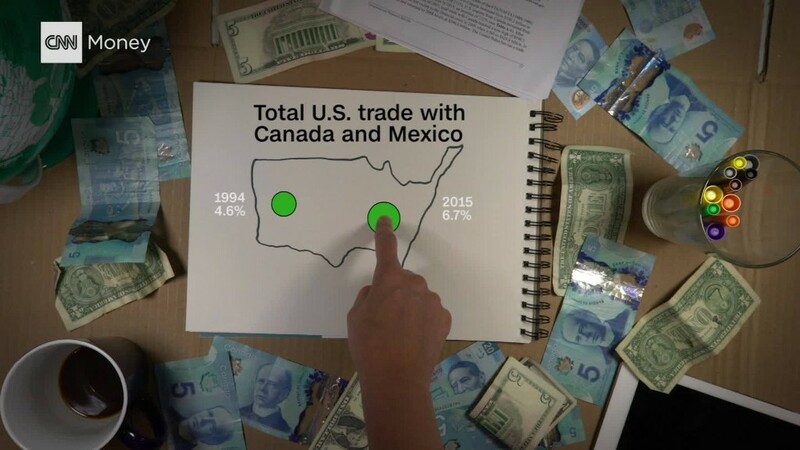 The United States ran a nearly $50 billion trade deficit with Mexico in 2015, meaning it bought more goods and services than it sold to its southern neighbor. But the U.S. had a $12 billion surplus with Canada in 2015. In the memo to Congress, Vaughn also says the White House wants to be able to prioritize U.S. companies over Mexican and Canadian ones for any American government contracts. On the campaign trail, Trump made it sound like he wanted to rip up NAFTA altogether. This latest memo from Vaughn is much softer in tone and doesn't call for sweeping changes. "Improving NAFTA has the greatest potential to benefit the workers, farmers and firms of the United States," the memo says. It notes that Canada and Mexico are "among the largest export markets for [U.S.] manufacturing." The European Union is the No. 1 destination overall for American exports. Canada is No. 2 and Mexico is No. 3, according to U.S. Census data. The main changes to NAFTA outlined in the memo are to allow the U.S. to put penalties like tariffs on in certain situations and to establish clearer rules for intellectual property and labor rights. Vaughn calls NAFTA "clearly outdated" and in need of an upgrade. -- CNNMoney's Patrick Gillespie and Leyla Santiago contributed to this article.